The Sleeping Beauties all come from different backgrounds. 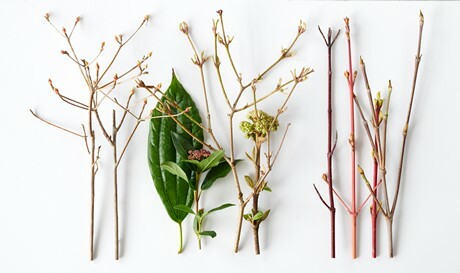 Dogwood grows in Europe, Asia and North America, whilst Viburnum grows further south in temperate and subtropical regions in the northern hemisphere. Redvein enkianthus is native to the region from the eastern Himalayas to Indochina, China and Japan. All three are decorative, easy, and strong ornamental shrubs all year-round with a rich choice of sizes and colours available. Viburnum tinus is the popular evergreen ‘snowball’ that flowers with white umbels and later produces steel-blue berries. Viburnum daviddi is also evergreen, and grows less high with slightly coarser foliage and more robust flowers. Viburnum x burkwoodii and V. bodnantense are ‘naked flowering’, producing flowers late in winter and only making leaves then. This ornamental shrub is part of the heather family, which also includes Erica, Calluna and rhododendron. E. campanulatus has bell-like flowers in white, pink and red or a mixture of the three. The attractive layered growth of the straight main branches is a feast for the eyes. The best-known dogwood species is Cornus mas which comes into bloom early as a naked flowering plant, and only produces leaves later. Cornus alba and C. sanguinea are particularly known for their winter look with their bare coloured branches in red, yellow, orange or black.